Alexander Downer, "Proud of the Role We Played in Saddam's Overthrow"
Alexander Downer was Australia's minister for foreign affairs from March 1996 to November 2007, the longest serving in Australian history. In July 2008, he was appointed by U.N. secretary-general Ban Ki-moon as the world body's special envoy to Cyprus. 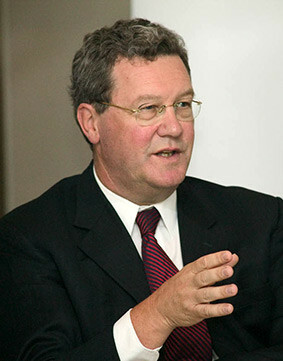 Born in 1951, Downer received a bachelor's degree in politics and economics from the University of Newcastle in the United Kingdom. He entered the Australian diplomatic service in 1976, serving in his government's delegation to the North Atlantic Treaty Organization and at the Australian embassy to Belgium and Luxembourg before becoming the senior foreign affairs representative in South Australia. In 1982 and 1983, he was a political adviser to Prime Minister Malcolm Fraser and, after the election of March 1983, to Andrew Peacock, the federal leader of the opposition. In 1984, he entered parliament as the representative for Mayo, a seat he has since held without interruption until his resignation from parliament in July 2008, following the electoral defeat of the Liberal government, headed by John Howard, the previous year. Daniel Pipes interviewed him in Adelaide on August 18, 2010. Middle East Quarterly: Serving as the United Nations secretary-general's special adviser on Cyprus is a seemingly thankless task, trying to negotiate a settlement for one of the world's most intractable conflicts. What induced you to accept this position? Alexander Downer: I thought it was an interesting challenge. Both President Dimitris Christofias of Cyprus and Mehmet Ali Talat, the Turkish Cypriot leader, struck me as being very committed to finding a solution, and I thought it would be good to provide some help if I possibly could. Cyprus is strategically very important, and there are all sorts of political implications that should flow from an agreement between the Turkish and the Greek Cypriots to achieve a federation and, therefore, the country's reunification. So it's an interesting and massively difficult job. If it weren't so difficult, the problem would have been solved many years ago. You've got to assess whether the policy, which in this case is set by the U.N. Security Council, is realistic, and on balance, I think it is realistic. It's a problem that can be solved. MEQ: So you have a grain of optimism? Downer: Yes, I am cautiously optimistic. I think it can be done. Many of the world's disputes are not diplomatic but rather political. And if you want to try to solve some of these global problems, your first lesson has to be in the politics of the place. You have to understand what drives the leaders, which is usually the voters, and what drives the voters; why they think the way they do; why there is so little trust between protagonists, and how trust can be built; what is tolerable or intolerable for leaders within their communities; and what sort of compromises could be sold by the leaderships to their constituents. You've got to understand all of that in order to have any chance of making a valuable contribution to solving these problems. All too often the international community tries to solve disputes through diplomatic means. This is the American approach, the European approach, and the Russian approach—and they all expect that somehow things will fall into place. It won't work like that. You've got to think about the people, the voters in the area of contention and how they think; and once you understand this, you can start—not from the top down but from the bottom up, thinking about how you can put together solutions. That's what we tried to do in Cyprus. MEQ: You've been in this role since 2008. Have you seen a change in the stances, public and private, in Turkish diplomacy as the Justice and Development Party [AKP] becomes more and more overtly Islamist? Has this been reflected in the Cyprus situation? Downer: Not really. I think the Turkish government has several clear reasons to see the Cyprus problem solved, none of which have anything to do with religion. They have to grapple with the burden of the Turkish Cypriot economy, which they have to subsidize to the tune of some $700 million a year. They have a large number of Turkish troops in Cyprus for which they have to pay, and they have some problems in the European Court of Human Rights. And Turkey can never become a member of the European Union as long as Cyprus is divided because the Republic of Cyprus [the Greek part of Cyprus] is part of the European Union, and so is Greece. Each of the EU's twenty-seven members has a veto over a new membership, and Greece and the Greek Cypriots will always veto Turkish membership so long as the Cyprus problem remains unresolved. MEQ: You mentioned the European Court of Human Rights. A recent ECHR decision finds that Greek Cypriot reparation claims can be properly adjudicated by a Turkish court and that it would be wrong to rectify the situation by allowing Greek Cypriots to return to their homes and expelling Turkish Cypriots who currently live in the area. Is this a constructive development? Downer: It's obviously an important decision, which had a big impact on the thinking of the two sides and the negotiations between them. From our point of view in the United Nations, both sides have to accept the court's decisions as it is a legitimately established court. Both Turkey and the Greek Cypriots are members of the European convention on human rights from which the court ensued, so they have no choice but to accept its decision. MEQ: A recent position paper presented to the Netanyahu government referenced that ECHR decision as a potential model for dealing with the issue of a Palestinian "return." Do you agree? Downer: What you need to look at in terms of rights of return is a precedent in international law, and you can look at Cyprus and decisions by the European Court of Human Rights. You can also look at what happened in the Balkans—in Bosnia, between Croatia and Serbia, and so on, as well as what happened in Eastern Europe and to some extent in Russia since the end of the Soviet Union and the collapse of communism. There is a whole body of legislation that is important in terms of establishing how a right of return works. Then there is the big question of property rights: Do the original owners have all the rights, and do present users have any rights? For those of us who live under the Anglo-Saxon system of law, there is the whole concept of common law and the extent to which that should be applied in terms of remedies to people in these situations. The concept of a right of return has great political potency. You go into the refugee camps in Lebanon or in Gaza, and this notion of a right of return is politically very alive, and you can't ignore that. On the other hand, if you want to take a legalistic approach, there is a body of law that could best be summarized as complex, and what the European Court of Human Rights has alluded to is that the passage of time can be an important factor—not in terms of property ownership but in terms of a right of return versus compensation. These are all complex legal issues, but the legal component is only part of it. You can't ignore the politics of these questions. I don't know how easy it would be to walk into one of the refugee camps in Lebanon and try to explain complex concepts of common law property rights and the rights of property users under this law to its residents. MEQ: As we are just before the Australian national elections, do you perceive a basic bipartisanship on Israel and related issues continuing regardless of which faction wins? Downer: There have been some differences between the Howard [Liberal] government [1996-2007] and the Rudd [Labor] cabinet [2007-June 2010], but they haven't been very substantial. For example, the Howard government was very insistent that the International Court of Justice [ICJ] was not the right place to go to consider the issue of the Israeli security barrier; and when there was a resolution at the U.N. General Assembly calling for the implementation of the IJC's advisory opinion, the government voted against it, and it was one of only six governments to do so. The Labor party at that time said, as did Kevin Rudd himself, that Australia's position would be better off if we abstained. Now, under Labor, Australia is running for a seat on the Security Council in 2012-14 whereas the Liberals say that they would withdraw this candidacy as it wouldn't be worthwhile to compromise Australia's international integrity for a two-year seat on the Security Council. So, yes, there probably would be some difference. MEQ: I didn't mean to imply there would be no difference, but I was assuming there is a basic bipartisanship on Israel? Would you agree with that? MEQ: And that will presumably continue? Downer: Yes. There is a consensus on some very simple propositions, and Israel's right to exist within secure borders is absolutely accepted across the Australian political spectrum. There would be no political party in Australia that would oppose a two-state solution in the Middle East, not even the minor parties. When you get into some of the details there are differences, but not fundamental differences. MEQ: Are sanctions and other nonviolent steps sufficient to prevent the Islamic Republic of Iran from acquiring nuclear weapons, or might military force be required? Downer: I hope that the latest round of sanctions that are being passed now by the Security Council will have the desired effect. But time will tell, and we'll just have to wait and see. MEQ: Do you think that Tehran might deploy nuclear weapons? Downer: Their ambition is to have the capability to develop nuclear weapons should they ever feel there was a need for them. That's not to say they think the circumstances are there now. But, obviously, if Iran ever got nuclear weapons, it would be a game changer. MEQ: Which do you think is worse: a nuclear armed regime in Tehran or the consequences of military strike on Iran? Downer: I hope the sanctions are successful. MEQ: In 2007 you denied a Saudi request to fund a mosque here in Adelaide, citing concerns about potential Wahhabi influence and those who might frequent the mosque. Would you explain your reasoning? Downer: I am an Australian democrat, and I am all in favor of people practicing whatever religion they wish to practice. But I am not in favor of extremism, and some of our agencies drew my attention to concerns they had about the people behind the proposal to establish this mosque, that this could be turned into a center of extremism. So we advised the Saudis of that, and the project didn't proceed. MEQ: Did this decision have further consequences? MEQ: Was this unique in your experience? Downer: Yes, this was the only occasion when this happened. I know that the Saudis wish to fund mosques, and that's fine, but we don't want here what we've seen in some other countries—the use of certain mosques as centers of extremism. We are very happy to have mosques everywhere in Australia. There are 340,000 Muslims in Australia, and they've got a right to go to a mosque. I have no problem with people establishing mosques, and I have no problem with the Saudi government providing some support for those mosques; it is a friendly government of ours. But on the other hand, if accidentally and not deliberately, they find themselves funding a mosque that is being established by extremists, then that is something that we reasonably could be expected to resist. It is similar to the situation where the German government recently shut down the so-called 9/11 mosque in Hamburg. I might have closed it down the next day, on 9/12. People always say that I am a black-and-white person, and I am sure there were areas of grey there. But for me, preventing the establishment of a mosque that could be a center of extremism was important, and I have had no problems with what we have done. MEQ: Do you consider the Howard government's creation of schools of "Islamic Excellence" to be a success? Downer: Seems to have been. One of the things that surprised people about the Howard government was that we provided a lot of government funding for nongovernment schools—Christian schools but also Muslim schools. I don't have a problem with there being Muslim schools, just as I went to a Christian school myself, and there are Jewish schools as well. That's not a problem. The problem is extremism. MEQ: In seeking to find moderate Muslims, you supported Houssam Abiad for a seat in parliament. However, as recently as March 2008 he described the founding of Israel as "a triumph of racism" and accused Jerusalem of "ethnic cleansing." How do you respond to criticism that you made an error in this instance? Downer: If he did say those things, I made an error. I certainly wasn't aware at the time that he had said those things, and it has been drawn to my attention more recently. He has got a very good CV; he has been a very successful Australian. Not surprisingly, when he came to see me to seek my support, he didn't draw that to my attention. MEQ: Australia has over 2,300 troops in Afghanistan and about 80 or so in Iraq. Do you endorse their continued presence? Downer: Sure, I do. I am very proud of the role we played in Saddam's overthrow, and I will not take one step back on that issue to the day I die. Iraq is difficult and complicated and has always been since its creation in 1921, so I expect it to continue to be difficult. But we are better off without Saddam Hussein and his regime. The war against terror would have been a good deal more difficult if Saddam had remained and complicated matters in all sorts of ways that he did. As for Afghanistan, getting rid of the Taliban regime was definitely the right thing to do. People have their own theories about how the war in Afghanistan could be better fought. Everybody agrees about the need for a very effective hearts-and-minds campaign, that there should be substantial aid programs, and that more needs to be done to stop the trafficking of narcotics. I often make the point that the Afghan army and police must be properly resourced, that soldiers and police should be properly paid, which is not the case at the moment. But it's going to be a long, hard struggle. For those people who think that it would be better just to give up, I say, "Before you go out and tell your local politician that the answer is to give up, make sure you've thought through what the consequences of a withdrawal from Afghanistan would be." And I am not one of those who think that you should set a timetable for withdrawal, telling your enemies in advance when you are going to leave. It's like going into World War II and saying, "We will fight until January 1945, but after that we are not going to fight anymore." Hitler would have just said, "Well, I'll hang on until January 1945, take a hell of a battering, but if I can survive beyond January 1945, I win." I would always make withdrawal conditions-based, not time-based, and this certainly needs to be the case in Afghanistan. It will take a long time: You've got very low levels of literacy; about half of the effective GDP [gross domestic product] in the country is from narcotics; you've got a government whose reach doesn't extend much beyond Kabul; you've got widespread corruption with people changing sides on the basis of money. It's tough, but the alternative of handing Afghanistan back to the Taliban would be disastrous for the Afghan people. If you don't learn the lessons of history, you're doomed to repeat them. MEQ: You wrote in 2009 that the coalition's goal in Afghanistan "should be to allow the Afghan people to run their own country as they see fit but to do so in a way that is not threatening to the outside world. The idea that some sort of idealized democracy can be established of the kind we have here in Australia is just unrealistic." How would you respond to the criticism that you have abandoned the field to those who would shut down schools for girls and swathe women in burqas? Downer: I am obviously not in favor of those things happening, and I certainly wouldn't want the sort of extremism that was exercised by elements of the Taliban before the end of 2001 to return. There's a balance here. In international relations you have to deal with reality. It is unreal to think that you could establish in Afghanistan the sort of society as in Australia or the United States. That's not going to happen. There are traditions and values that they have, that we don't particularly share, some of which we look down upon. I am obviously much in favor of equality, including gender equality in education and the workplace, so I would hope that will never regress to that extent. But it's not going to work as a democracy like in our countries. Not in my lifetime. News release, U.N. News and Media Division, New York, July 17, 2008. Ynet (Tel Aviv), Aug. 8, 2010. The Taiba mosque in Hamburg, frequented by some of the 9/11 attackers, was shut down on Aug. 9, 2010, and the cultural association that ran it was banned on the grounds that it was again being used as a recruitment and meeting point for Islamist jihadists. The Guardian (London), Aug. 9, 2010.—Eds. The Australian (Sydney), June 5, 2010. Alexander Downer, "The Afghan Dilemma," The Advertiser (Adelaide, Aus. ), Oct. 25, 2009.